Fully-extending drawers with retrofit soft-close system. Laser-cut and hand-cambered iron handles. hand-rubbed die-casted aluminium feet. Chest of drawers with structure and drawers front in ash veneered wood and solid wood. Drawer runners with Blumotion technology. Brass Decò handles, with buffalo's horn inset. ... pieces to morph into a variety of environments and be versatile for the way you live. FEATURES: Twelve drawers. Jewelry tray in top left and right drawer. Classic Italian elegance A unique collection, where fusion coexists with a variety of styles. The formula for Volpi contemporary living. Chest of drawers with 3 drawers and curvilinear profiles. Chest of drawers-writing desk with secret compartments and marquetries. Marquetries are in made of oak walnut, maple and cherry wood. Walnut finish. Chest of drawers with secret compartments and marquetries. Marquetries are in made of oak walnut, maple and cherry wood. Walnut finish. 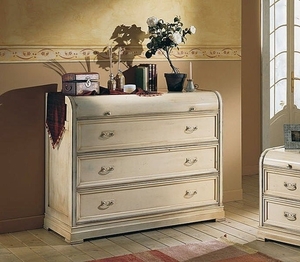 A traditional chest of drawers uses familiar construction methods, materials and forms, and may be preferred to other chests for its conventional style. On ArchiExpo, this furniture is categorized by material or finish. These pieces may blend well with certain period decor and can be a less expensive alternative to period furniture. They are used in the home and in public and commercial spaces such as hotel rooms for storage and display. Consider available space. There should be enough room to move easily around the piece and to open the drawers completely. Coordinate appearance and dimensions with surrounding furniture, including style, finish and height. Maintenance requirements, the need to reapply wax or other finish products, the unit's ability withstand regular use and support the weight of items to be stored are additional factors to keep in mind.